Phil Mickelson came under fire for hitting a moving ball on Saturday. SOUTHAMPTON, N.Y. – The visual of Phil Mickelson, one of the most accomplished golfers of the last 25 years with five major titles, jogging to catch up with his golf ball Saturday as it raced down a hill at the 13th green and putting it while it was still moving, had everyone watching rubbing their eyes in disbelief. Mickelson's action resulted in a 2-stroke penalty and a score of 10 on the par-4 hole under Rule 14-5 of the Rules of Golf. But it also could have resulted in a disqualification, something that the rules committee of the U.S. Golf Association chose not to consider. "At that time I didn't feel like going back-and-forth and hitting the same shot over. I took the two-shot penalty and moved on... I don't mean any disrespect." The adventure took place on the par-4 13th. Mickelson's fifth stroke was a putt that went by the hole and began going down a slope. He ran a few steps toward it and hit it before it stopped, sending it by the hole back to near where he originally putted from. He needed two more putts to get down from there. In interviews with Fox Sports and reporters afterward, Mickelson, who finished with an 81 on a day when fans serenaded him throughout the course on his 48th birthday, insisted he meant no disrespect. "I didn't want to continue my (putting) display and I gladly took the two-shot penalty and moved on," he said. "I don't mean it disrespectfully. If people take it that way, that's not on me. I'm sorry that you're taking it that way. It's certainly not meant that way. Sometimes in these situations, it's just easier to take the two shots and move on." Mickelson insisted he was not frustrated by the more difficult hole locations in the third round. "Look, everybody's got to play it so I'm not saying either way," he said. "Everybody's got to play it. I was playing it worse than most and wanted to get to the next hole eventually, which I did." The action by Mickelson was reminiscent of a similar incident at the 1999 U.S. Open at Pinehurst involving John Daly. In the final round that year, Daly hit a moving ball on the green as it was rolling back toward him following a putt that didn't quite make it up the hill. 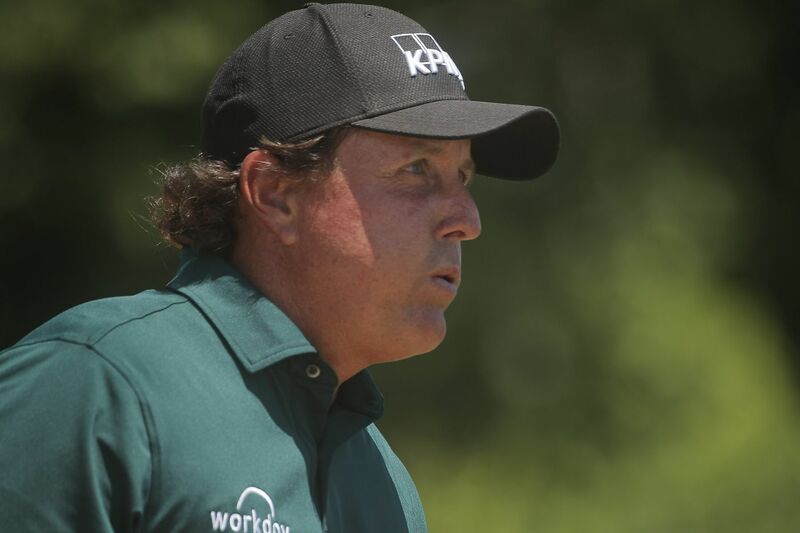 Daly was roundly criticized for what he did, as was Mickelson, although Mickelson had to absorb the wrath of Twitter amid dozens of replays shown on the Fox telecast. But he shrugged off a suggestion that he did damage to his reputation as one of the game's most popular players. "I don't see how," he said. "If somebody's offended by that, I apologize to them but, you know, toughen up because this is not meant that way. It's just simply I just wanted to get on to the next hole and I didn't see that happening at the time. I'll gladly take my two strokes and move on." Many observers on Twitter were calling for Mickelson's disqualification. Rule 1-2 of the Rules of Golf states, "A player must not take an action with the intent to influence the movement of the ball in play" and adds, "In the case of a serious breach, the committee may impose a penalty of disqualification." However, John Bodenhamer, senior managing director of championships and governance for the USGA, said that was not discussed by the rules committee. "To go to Rule 1-2, Phil didn't purposely deflect or stop the ball, which is talked about in the reference under Rule 14-5," he said. "If you look at it, rule 14-5 explicitly covers a player making a stroke at a moving ball, and so we operated under that rule." Mickelson said it's a matter of knowing the rules and taking advantage of them. "I think there are times when it's strategic and I think knowing the rules is never a bad thing," he said. "You can always use them in your favor. It's a risk. I could have maybe hit a shot and somehow made the putt. I don't know if it would have saved me a shot or not. I might have saved a shot doing it the way I did. So either way, there's no disrespect meant." Mickelson's playing partner, Andrew "Beef" Johnston, said he saw Mickelson hit the moving ball and asked himself, "Is this actually happening? "Honestly, I said to him, 'I can't help but laugh,'" he said. "That's one of the funniest things I've ever seen. He didn't really say much, he just started laughing." It certainly was one of the most surreal moments of all the 118 U.S. Opens contested.